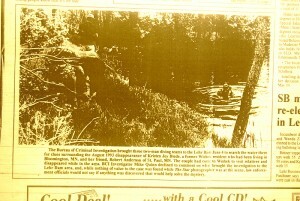 Wishek Star Front page from June of 1996 – Investigators brought three diving teams to the area to search for Kristin Joy Diede and Robert Michael Anderson. 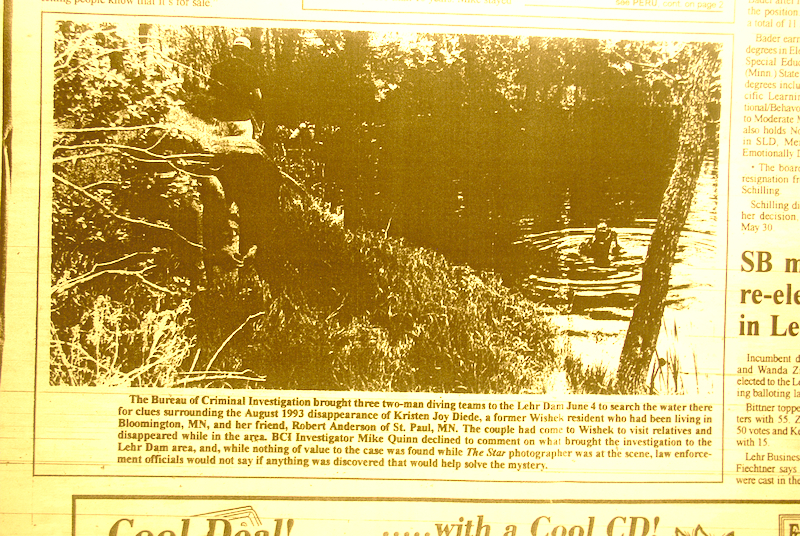 In one of few news articles published regarding the disappearance of Kristin Joy Diede and Robert Michael Anderson, the Wishek Star reported in June of 1996 that the North Dakota Bureau of Criminal Investigation brought divers to the area that month. According to The Star, three two-man diving teams searched an area called “The Lehr Dam” on June 4th of that year. While a photographer for the Star was on scene, investigators declined to comment on the results of the search. The article does state, however, that the search was specifically regarding to the case of missing persons Kristin Joy Diede and Robert Michael Anderson.